Leading members of Congress are calling on President Barack Obama to fire one of his top advisers amid a deepening scandal over accusations the White House intentionally misled lawmakers and the American public about the contents of last summer’s comprehensive nuclear agreement with Iran, according to a letter sent Monday to Obama and obtained by the Washington Free Beacon. 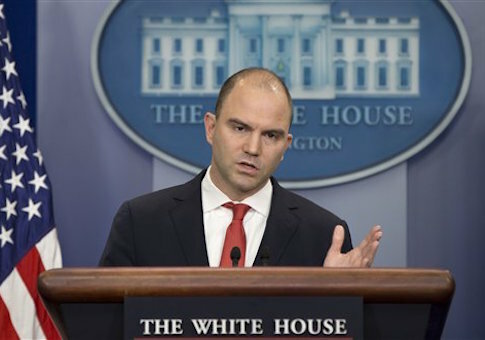 The lawmakers are pressing Obama to fire deputy national security adviser Ben Rhodes following revelations he and other officials "spearheaded the charge to mislead elected lawmakers and the American people about the Iran nuclear deal and the negotiations that led to this agreement," according to the letter. Rhodes will skip a Tuesday hearing before the House Oversight Committee as it investigates claims he and other senior White House officials waged a misinformation campaign to garner approval for the contested Iran deal, according to sources who spoke to the Free Beacon. The White House kept congressional sources in the dark until late Monday afternoon, when officials finally disclosed that Rhodes would not testify as the result of "constitutional concerns," according to conversations with congressional insiders and a letter sent by the White House. Rhodes’ reported spin campaign has become a flashpoint following a lengthy New York Times magazine profile detailing his attempts to mislead reporters and D.C. insiders about the contents of the nuclear deal. The scandal has put the White House in a tricky position as it attempts to uphold the nuclear deal while avoiding public questioning about the deal’s substance. Rep. Jason Chaffetz (R., Utah), chair of the oversight committee, suggested that Rhodes could be subpoenaed to testify should he fail to attend Tuesday’s hearing. Lawmakers who wrote to Obama on Monday demanded Rhodes be fired or forced to resign as a result of his actions. Sens. Mark Kirk (R., Ill.), chair of the Senate's subcommittee on national security and international trade and finance, John Cornyn (R., Texas), Senate majority whip, John Barrasso (R., Wyo. ), who sits on the Senate Foreign Relations Committee and is chair of the Senate Republican Policy Committee, and David Perdue (R., Ga.) have signed the letter. "We call on you to dismiss Deputy National Security Advisor Ben Rhodes before he further tarnishes the Office of President," the lawmakers write. "While members of the Executive and Legislative branches may sometimes deeply disagree on issues of vital importance to our nation’s security and prosperity, we should all agree, for the greater good of our Republic and the citizens whom we represent, to engage in our debates in a respectful, honest, and constructive manner." "Mr. Rhodes’s disrespectful, deceptive, and destructive conduct has fallen appallingly short of this standard, however," they write. "Indeed, if he had conducted himself this way in a typical place of business outside Washington, where American taxpayers work, he surely would have been already fired or asked to resign." The lawmakers further accuse the administration of breaching the American people’s trust and of insulting Congress. "What steps will your Administration take to restore the trust of the American public and members of the news media after Mr. Rhodes’s admitted that he purposefully ‘created an echo chamber’ during the debate over the Iran nuclear deal with the objective of propagating misconceptions?" the lawmakers write. Rhodes is facing further accusations he "repeatedly displayed an astonishing level of disrespect towards the U.S. Congress as he described his role in the important debate over the Iran nuclear deal’s merits last year," according to the letter. The administration must publicly distance itself from Rhodes and his statements, the lawmakers write. "Do you agree with Mr. Rhodes’s contention that it is ‘impossible’ for elected U.S. lawmakers to engage in a ‘sober, reasoned public debate’ with your Administration over Iran or other issues vital to America’s security and prosperity?" the letter asks. "What steps will your Administration itself take to engage in rational discourse and repair damaged relations with the Congress?" Questions have arisen over a series of claims by the Obama administration that appear to conflict with the agreement. One controversy has surrounded the administration’s shifting claims about the legality of Iranian ballistic missile tests under the deal. While the administration initially promised Congress that such tests would be barred by the agreement, White House officials now maintain that they only are "inconsistent" with it. Deal critics have viewed the shift in rhetoric as a way for the administration to stave off Iranian anger surrounding the issue. The administration has avoided multiple congressional inquiries on the matter. Critics have also raised concerns over reports that the White House is considering a plan to grant Iran access to the U.S. dollar, which officials had also promised would not take place under the deal. The dollarization issue has emerged as a sticking point in a recent deal in which the White House will purchase 32 tons of nuclear material from Iran for a price of $8.6 million, a payment that will be taxpayer-funded. Obama administration officials have declined to provide details about the deal, including the payment method, until the deal is complete. Sources familiar with the line of questioning Rhodes was likely to receive told the Free Beacon that lawmakers would focus on the issues as well as the source of the misinformation about the deal. Congress seeks to determine who was part of the White House’s propaganda effort to sell the deal, including which reporters and other D.C. insiders were given experts who helped push the effort. White House spokesman Josh Earnest deflected questions from reporters last week about whether Rhodes will appear before Congress. This entry was posted in National Security and tagged Barack Obama, Ben Rhodes, Iran, Iran Nuclear Deal. Bookmark the permalink.